Have you ever thought about selling the family business? Maybe you created it from the ground up. Or, maybe you inherited it from your parents but aren't sure if you want to continue it. Or, maybe it's time to consider retiring but the kids aren't interested in stepping into your position. There's a lot to think about. I received a book for review. This post contains affiliate links, and I will receive compensation if you make a purchase after clicking on my links. While family businesses are an important and dynamic part of the global economy, their survival statistics are grim. In fact, a mere 30% of family-owned companies make it past the first generation. So, when you’re ready to take the leap, it’s essential to do it right. Now, award-winning CEO Jonathan Pellegrin has cultivated a fool-proof formula for transition success. 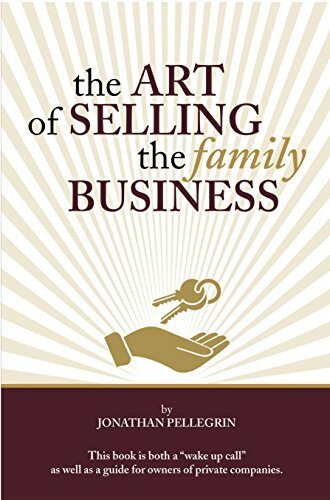 If you're considering selling a family business, this book is a wake-up call that you need to read. I had no idea that there were so many things to consider. There are case studies, statistics, and lots of valuable information to be aware of before you take that first step. Buy it today on Amazon. Take a moment to check out the preview of this book below. Well, this is very interesting and comes at a good time. I will check this out. Thanks! Thanks, Lisa! It’s a great book. We don’t have a family business. My dad is a retired engineer. I have always admired and usually trusted businesses that have been passed down from generation to generation. What I find sad is when the business can no longer make a profit and is forced to sell, like so many farms these days. It’s so competitive and sometimes makes sense to sell so it’s good to read up on the topic. It can definitely be a challenge to have a family farm!